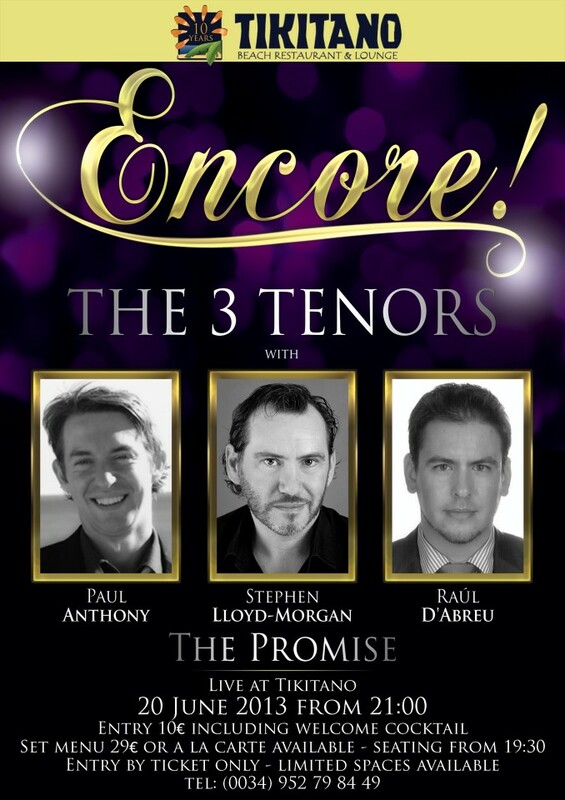 New Performance Dates June & July “West End Musicals in Concert”, “Encore!”–The 3 Tenors & Tenor Stephen Lloyd-Morgan | Marbella Marbella – Adelante! 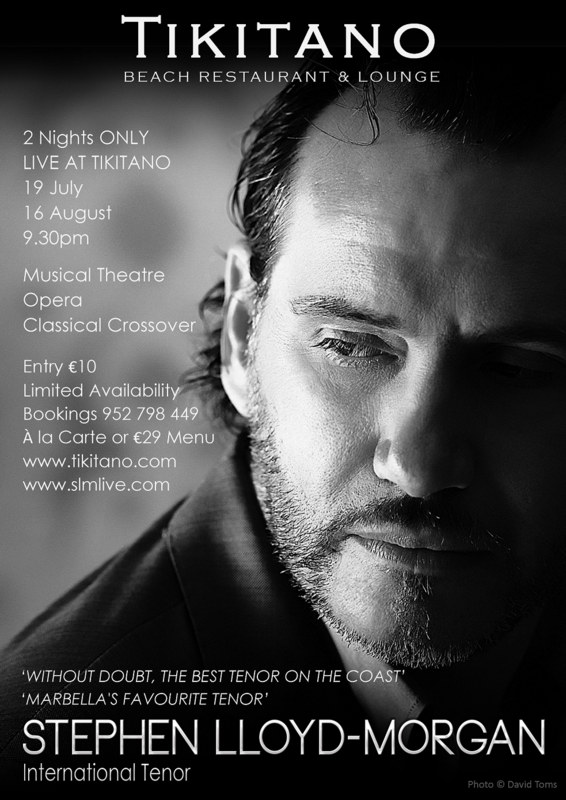 Also for 2 Nights ONLY on 19th July and 16th August International Tenor Stephen Lloyd-Morgan LIVE AT TIKITANO with repertoire of Musical Theatre, Opera and Classical Crossover. 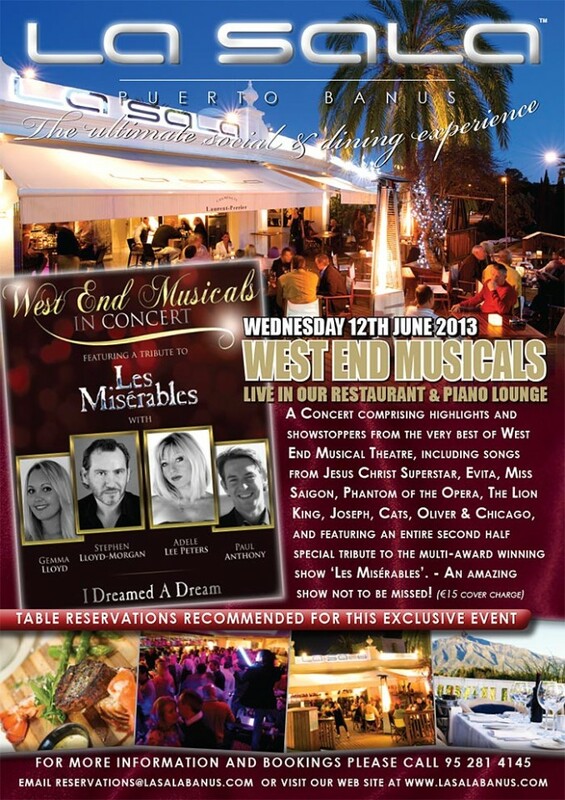 The show comprises highlights and showstoppers from the very best of West End Musical Theatre, including songs from Jesus Christ Superstar, Hair, Evita, Miss Saigon, Wicked, Phantom of the Opera, The Lion King, Joseph, Cats, Oliver & Chicago, with the entire second half currently dedicated to the multi-award winning show ‘Les Misérables’. with €10 per entry donated to the JW appeal. €45 inc. welcome drink, 3 course dinner, 1/2 bottle of wine and the concert. €29 – 3 course menu or a la carte Entry €12.50 cover charge. Entry €15 cover charge. À la carte menu. 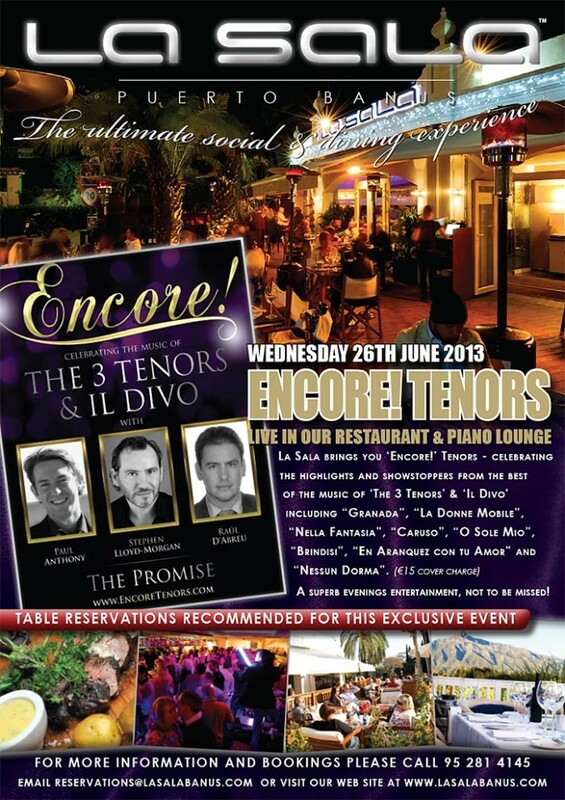 We are delighted that on 3rd July and 1st August Encore! 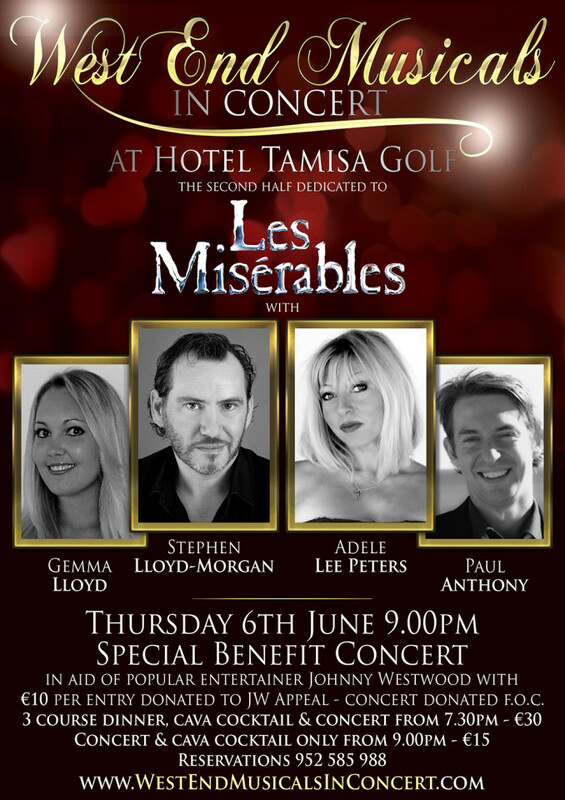 will be joined by special guest soprano Julie-Anne Hunter. Stephen Lloyd-Morgan is invariably referred to as “Marbella’s favourite Tenor” & “is without doubt, the best tenor on the Coast”. He is a very experienced performer who studied Opera at the Welsh College of Music & Drama and Musical Theatre at The Mountview Academy of Performing Arts in London. 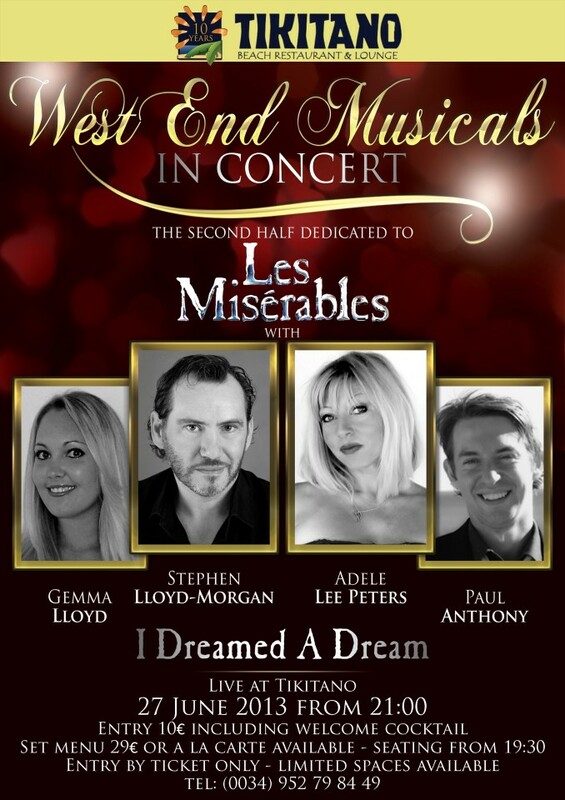 with repertoire of Musical Theatre, Opera and Classical Crossover. €29 – 3 course menu or a la carte Entry €10 cover charge.